It is hoped that this book will be useful to Catholics and other Christians in tracing how Friends successfully employ a tradition of religious decision making which is deeply embedded in Scripture but which other Christians have typically lost. In particular, the ways Quakers seem to avoid the problem which face Catholics new to the method are explored. Social scientists and political philosophers are invited to discover in Quakers what may be the only modern western community in which decision making achieves the group-centered decisions of traditional societies. The conclusion discusses Friends as a possible answer to the common contemporary wish for advancement beyond the fragmented individualism of “liberal” man. Finally, the author hopes Quakers themselves will find in these pages a helpful mirroring of Friends decision making. 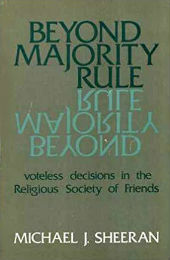 Newcomers to Quakerism and those in roles of leadership within the community may see in this study an outsider’s understanding of the possibilities and pitfalls of the Quaker method of going beyond majority rule.